Thank you again to all who applied for recognition this past 2015-2016 school year. Thank you to those who wrote in asking questions about the application process. We will be putting away the 2015-2016 applications and closing the window on re-evaluation of any applications on August 30,2016. We look forward to your success this coming year. In order to acknowledge their efforts, all schools that earned the Bronze, Silver, Gold, or Platinum Levels are featured on our website, and each principal received a congratulatory letter with a window decal award. A communication announcing the Recognized Schools is being sent to PBIS partners and stakeholders across the state. The complete list of Recognized Schools can be found below, as well as electronic images of the decals for download. Congratulations to all of these Recognized Schools for your outstanding efforts implementing PBIS. The dedication of everyone involved is to be commended. We encourage you to share this good news with your PBIS team, building staff, and students, as well as district leadership, families, and community partners. 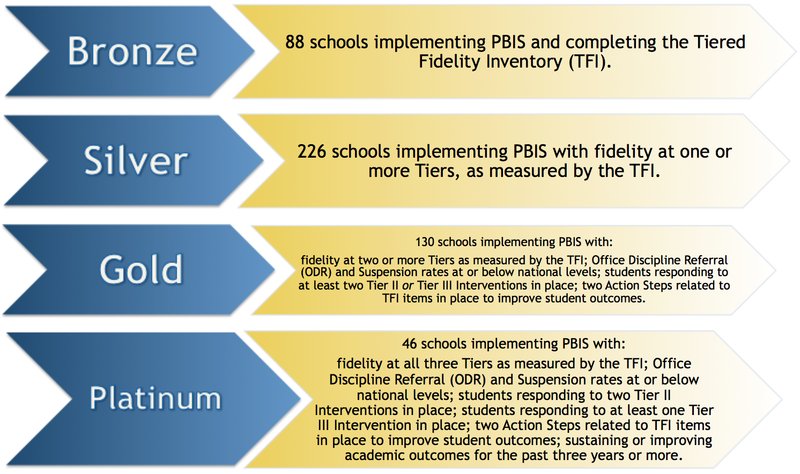 We know these schools will continue their progress implementing PBIS at all three tiers and providing effective supports for all students to achieve social, emotional and academic success! To download a copy of the list in the Excel format, use the "Open Recognition by District" link below. Once the file opens, go to "File", then "Download As", and select "Microsoft Excel". It can then be sorted by any data field for your specific use. Schools can download one of the four electronic decal files for print or web use. Simply click on the link for the level earned, and it will open a JPeg or PDF file in another browser or tab. Save the JPeg or PDF file to your local desktop.